ooh la la… spoken word, singer-songwriters and performances! 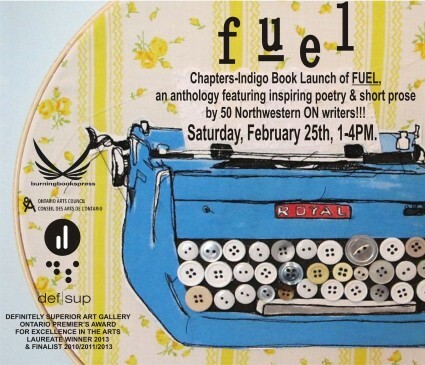 DefSup is heating up February at the Chapters-Indigo Book Launch of Fuel, an intriguing book, featuring 60 works of inspiring poetry and short prose by 50 talented writers – some of the best from Northwestern Ontario! Come out to experience this red-hot afternoon of the literary arts, where the creativity of the Fuel anthology is brought to life! Enjoy words and song, presented by some of the talented authors published in the book. Peruse and purchase signed copies of Fuel or as a gift. The cost of the book is $20.00. We’ll also have playful circus-y spinning performances and complimentary sweet treats, for the awesome people who come to visit our book sale table to say hello! Did you know that the Fuel anthology is a publication of burning.books.press, DefSup’s small book and zine publishing house? Our indie press was seeded by a generous pilot project grant, of the Literary Arts section of the Ontario Arts Council. Last but not least, here are the literary talents featured in Fuel! Authors: Reija J. Roberts, Chris Waite, Duncan Weller, Heather McLeod, Marianne Jones, Batia Boe Stolar, Taina Maki Chahal, Holly Haggarty, Nolan Schmerk (aka Solomon), Sandi Boucher (Mishkopaganaquek, Red Thunderbolt Woman), John Pringle, Ryan Anthony McInerney, Scot Kyle with art illustration by Christopher Stones, Renée Marie Terpstra, Helen Leaf Black, William Victor Roberts, Lisa Jeanne Jodoin, Brigitte Petersen, Kaitin Khubyar, S.Y. Wong, Ashliegh Gehl, Marion Agnew, Jayal Chung, Steven Gothard, Louise McKissick, Jack Shedden, Dave Simser, Eleanor Albanese, Roy Blomstrom, Brad McAllister, Wendy Galbraith O’Connor, Sue Blott, Sean Devine, D. Manfred Klein, Sharon Irvine, Keith Sato, Douglas Livingston, Aaron Veldstra, Keith Catton, Kurt Martell, Mary Frost, R. Cecil Burns, Erin Pamela Stewart, Jane Crossman, Katie-Ann Berube, Michael D. Maracle, Jolene Cheryl Simko. An intriguing and necessary book … featuring sixty inspiring works by fifty talented writers – some of the best from Northwestern Ontario! This new book anthology presents a juried selection of excellent diverse poetry and short prose by Northwestern Ontario writers which will appeal to a broad adult and youth readership seeking a range of edgy to traditional works that are informed by a regional perspective, whether reflecting universal or place-based points of view. The book’s theme of “fuel” as a fiery elemental word promises the sense of excitement and inspiration that readers feel when engaging with skillful and spirited creative writing. Fuel will likely appeal to the reader who thrives on absorbing fresh creative human insights and enjoys a rich tapestry of ideas, conveyed in the more free-form styles of poetry as well as narrative storytelling in the form of short prose. It also offers a unique opportunity to discover fascinating new literary works by both emerging and more established writers from Northwestern Ontario. Reading this book, one may also get sense of what fuels the ideas and sparks the creativity of people from one part of Canada’s “nearer north.” The majority of writers in Fuel hail from Thunder Bay, the region’s largest city, while others are from the small towns and unorganized townships that pepper the vast landscape of Northwestern Ontario. Fuel promises readers an engaging reading experience, one definitely worth setting aside time for!